COLORADO SPRINGS, CO--(Marketwired - Jun 25, 2015) - Gold Resource Corporation (NYSE MKT: GORO) (the "Company") announces new Switchback drill highlights at its El Aguila Project. Gold Resource Corporation is a gold and silver producer with operations in Oaxaca, Mexico and exploration in Nevada, USA. The Company has returned over $104 million to shareholders in monthly dividends since commercial production commenced July 1, 2010, and offers shareholders the option to convert their cash dividends into physical gold and silver and take delivery. Switchback drill highlights include step-out Hole 515040, which returned 15.64 meters grading 2.85 grams per tonne (g/t) gold, 169 g/t silver, 0.52% copper, 1.60% lead and 10.16% zinc, including 6.59 meters grading 3.02 g/t gold, 134 g/t silver, 0.67% copper, 2.42% lead and 16.14% zinc (see table below). Hole 515040 was a 50 meter step-out hole expanding high-grade mineralization to the northwest and at the highest elevation to date. 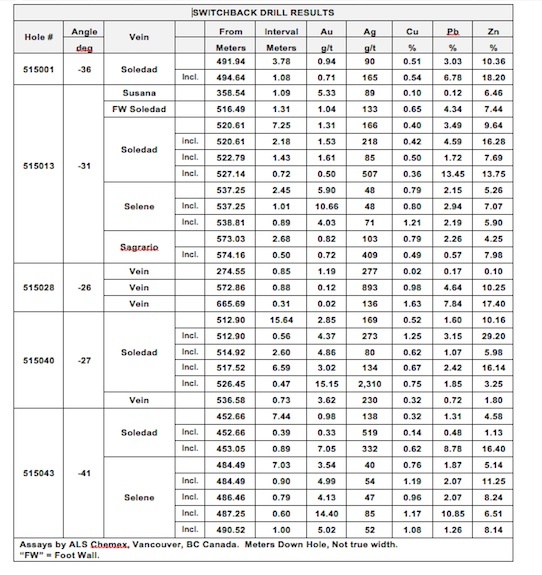 Four additional drill holes are reported in the table below, all of which intercepted polymetallic mineralization containing gold, silver, copper, lead and zinc. Four of the five reported drill holes intercepted multiple parallel epithermal veins. 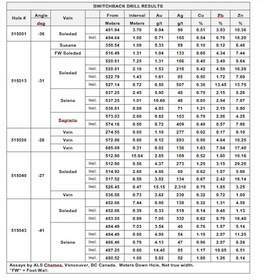 Almost all reported drill intercepts contain significant percentages of zinc ranging up to 29.20%. Base metal by-product credits increase the dollar value per tonne net smelter return (NSR) of the ore increasing potential profitability of the precious metal ounces. This latest round of drilling has now delineated the Switchback's mineralized horizon to 450 meter strike by 450 meter depth and remains open in all directions. The Switchback discovery, announced in June 2013, is located on the Company's El Aguila Project approximately 500 meters northeast of the Company's producing La Arista polymetallic (gold, silver, and base metals) underground mine (see maps below). The Company is currently drifting underground from Arista towards Switchback with a target of reaching the mineralized Switchback veins by year-end 2015. 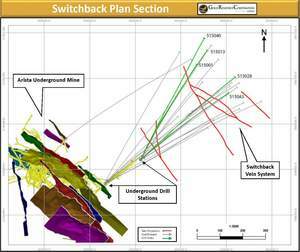 Mine development plans are in place with a goal of drawing mineral from Switchback the first half of 2016. As ongoing ramp development advances towards Switchback, a third drill station is planned for construction. This closer drill station plans for a more advantageous distance and drill angles to continue exploration at Switchback. The Company plans to commence another round of drilling later in 2015 to further explore and delineate the high-grade Switchback mineralization, while continuing to optimize the initial mine plan. Mr. Barry Devlin, Vice President of Exploration, stated, "The latest round of drill results from Switchback continue to define multiple robust, high-grade, polymetallic veins. We are excited to commence another round of Switchback drilling this fall from a closer distance and better angle to test above the high-grade just intercepted in Hole 515040. The goal of the next phases of Switchback drilling is to upgrade current mineralized material to the reserve category, as well as continued step-outs to test the extensions of this growing high-grade epithermal system." "These recent Switchback drill results, including 15.64 meters of 2.85 grams per tonne gold, 169 grams per tonne silver, 0.52% copper, 1.60% lead and 10.16% zinc, remind me of the exciting evolution of the Arista discovery and its early delineation phase," stated Gold Resource Corporation's CEO and President, Mr. Jason Reid. 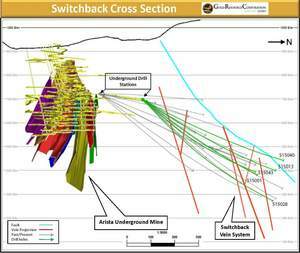 "There is a very good chance we have found the next Arista deposit at Switchback, or perhaps it's an extension of Arista, which speaks to the growing potential of this epithermal system. Our plan to touch the mineralization by year-end could see us pulling tonnes for mill feed during the first half of 2016."